Boneo Canine Maintenance Formula is an innovative and natural supplement for strong bones and healthy joints in dogs. Unlike glucosamine/chondroitin/MSM products that target only the joints, this unique lactoferrin-based formula also adds bone support. 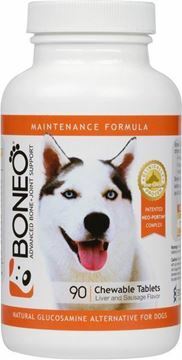 Boneo Canine is the first natural supplement that addresses the ENTIRE skeletal system- both the joints AND the bones.